Big, modern, concrete and glass, round. It is the largest Roman Catholic cathedral in England. 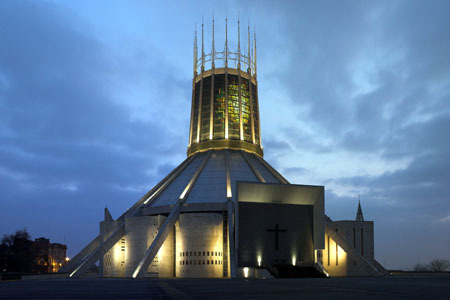 Dedicated to Christ the King and intended to resemble a crown, many Liverpudlians think it resembles a tent instead and so have dubbed it "Paddy's Wigwam." It was built to the design of English architect Sir Frederick Ernest Gibberd, whose rather strange bedfellows include London Central Mosque, the Didcot Power Station in Oxfordshire, the terminal buildings at Heathrow Airport, and the Inter-Continental Hotel, Hyde Park Corner, among others. The inside is rather stunning, with stained glass and coloured lighting creating an aura of tranquillity and intense religious feeling. They are part of Churches Together in the Merseyside Region and participate in a food bank. Friends of the Cathedral sponsor several educational, informational and fund-raising activities. The Art Studio takes care of making and repairing hangings, banners, vestments and stoles, not only for the cathedral but for neighbouring churches as well. There are several Sunday masses, including one in Polish, plus choral evening prayer, as well as masses and morning and evening prayer during the week. Mainly university from what I can see. The cathedral was built on the site of a former workhouse and looks along Hope Street to the Anglican cathedral. The Revd Canon Anthony O'Brien, dean of the cathedral. There didn't seem to be a lot of people, gut a guesstimate would be around 200, well spaced around the front semicircle. A greeter gave us an order of service and asked if we were visitors and where from. Not very! The seat itself was OK, but fixed kneelers were in the way of me getting my feet and legs comfortable. Supplied service sheet, which included readings, hymns and congregational bits. Organ plus a robed choir of boys and men. It was draughty, though on a warm summer's day this was bearable. I also noted that the servers were smartly dressed with black shoes and socks, with no outrageous colours showing below the cassocks. Formal. The mass setting was the Missa Brevis, op. 57, of Sir Lennox Berkeley, with a Gregorian creed and Sanctus. Two Vaughan Williams anthems were sung. Congregational hymns were of the traditional kind. My daughter had to step out mid-mass to put another hour on the parking meter, and she had to wait till the end of the eucharistic prayer to come back in, which I think was not unreasonable. 8 – The dean spoke well, but my ear is not accustomed to the local accent and I found it a bit odd. He linked the gospel reading (Mark 4:35-41  Jesus calms the storm) to the recent visit of Cunard liners and the 10 year diocesan project that has encouraged parishes to work together. The sun coming through the window. The organ voluntary (the Easter Chorale of William Mathias) at the end, where at last there was some oomph. The acoustics were not great. Much echo, so I couldn't hear the music as well as I would have liked. We stopped to listen to the voluntary while our seatmates climbed over us to get out. When we finally got up to leave, we noticed that the clergy were still in the vestibule but somehow we managed not to be spoken to. Coffee (instant), and tea served from teapots into cups with saucers. One plain biscuit was in each saucer. 6 – If I were local (but I'm not), I would like to establish if there was a regular active community. The calming, inspiring lighting effect of the interior.